Washington (CNN) - Only a third of all Americans approve of how President Barack Obama is handling the economy, according to a new national survey. And with a CNN/ORC International Poll also indicating that more than three-quarters of the public say the country is in bad shape right now, there's little wonder why the president is getting such low marks. According to the poll, released Wednesday morning, 28 percent of people questioned say things are going well in the country today. "That may be a slight uptick from early August but it still represents a double-digit drop from earlier this year," says CNN Polling Director Keating Holland. "And it's clear that economic jitters are a drag on President Obama's standing with the voting public." Obama gets good marks for his handling of international issues. Six in ten approve of his handling of terrorism and roughly half like his track record on foreign affairs in general and Libya in particular. 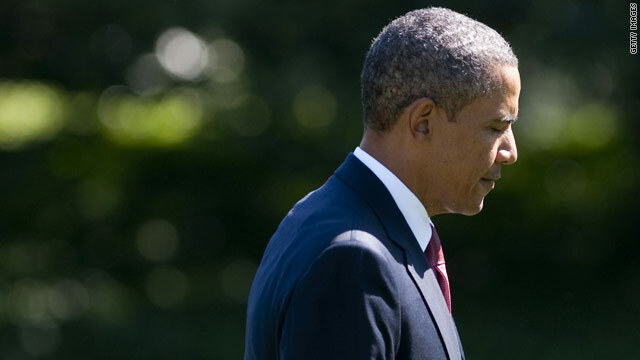 And 53 percent say they trust Obama as the nation's commander-in-chief. But only 34 percent approve of how the president is handling economic issues, with 65 percent saying they disapprove of how he’s handling the economy. Thirty-three percent give him a thumbs up on the budget deficit and 37 percent approving of how he's dealing with unemployment. "Two-thirds of Democrats continue to approve of Obama's economic record, but seven out of ten independents disapprove. Not surprisingly, more than nine out of ten Republicans also disapprove of how Obama is handling the economy,” adds Holland. According to CNN poll numbers released last week, the president's overall approval rating stands at 45 percent. The CNN/ORC International Poll was conducted August 24-25, with 1,017 adult Americans questioned by telephone. The survey's overall sampling error is plus or minus three percentage points. –CNN Deputy Political Director Paul Steinhauser contributed to this report. Personally I think Obama is nice family man, ok politician, and ok leader. Today to be a leader of the US. You must be willing to surgically cleanse the nation of a lot bad dudes. There are too many evil people who have power in US to allow anything good to happened. It is ok to take out bad guys in other countries. But the bad people that need to taken out in America have a buffer to help protect their interest. In the end you got stalemate. It is difficult for Obama to change his approach. From the beginning he has decided to take the high road by constantly giving the republican party an olive branch. I don’t think he is going to use another approach. Until governments learn to take care of their consumers (US. economy- is consumer based, 70% of the economy) the economies will never be stable. Consumers and the business/financial sector are interdependent but the financial part is legalized gambling. Remember, when the financial part brought down the U.S. economy, it was basically the consumers, who were barely able to keep the economy going, even though their purchasing power was weakened, as one result of business deregulation. Businesses are still begging for consumer, retail sales. To stabilize these up and down economies, STRICT BUSINESS REGULATIONS and a INTERNATIONAL LIVING WAGE, not a minimum wage, should be required of all nations (already in place in several places, LAX- for hotel workers). This will put all nations on a more even, economic, playing field and most likely get rid of slave labor and poverty. People, we need to stop blaming Republicans / Democrats for this country's troubles. In reality, we're all to blame. For far too long, we've let the politicians from BOTH parties bleed people dry. Either through taxes or letting jobs go abroad for cheaper costs, somehow and some way it is the American people that are forced to suffer. Instead of blaming each other, why don't we make our voices heard? Protests (peacefully), complain to your local representative! Something can be done. It's our right to voice our displeasure at the current way ALL POLITICIANS are doing their jobs. Instead of fixing this country's problems, they are taking donations and lining their own pockets. You see it on the news everday. So and so is now awarded this position. So and so is the new secretary of something...ALL NEW FACES, BUT NOTHING HAS CHANGED. We should exercise the rights our founding fathers fought for and believed in. They would certainly be spinning in their graves if they can see how we've squandered the rights that they fought for. We need to stand up and make our voices heard. We need to bring back the day when politicians need to remember that THEY WORK FOR THE PEOPLE, NOT THEMSELVES. We need to bring back the time when politicians were worried that if they performed poorly, it's them that's going to be out of a job, not us. Instead, far too many of us are going to ignore this message. The trouble is nowadays most of us would rather sit at home surfing the internet, or watching the big game. We always think that this country's problems are someone else's problem as long as these problems don't come to our doorstep. However, it's this type of thinking that has contributed to our current downtrodden situation. We need to do something now, because if everyone thinks that today is bad, tomorrow is going to be a heck of a lot worse. President Obama has just done another great thing for the American people! Today he created an online way for the American people to create and sign petitions to the government. Now anyone with access to the Internet can have their voice heard by the government! Check out MSNBC for more details and the site. Go Obama Go! Are you people blind? Barry had both housed for 2 years and could not get anything done except push the healthcare law that will probably be overturned. He's yet to set a budget and this is the 3rd time he's been laser focused on unemployment. Now he's sueing banks for issuing loans they were forced to write by Frank & Dodd. He's grasping for straws, but this latest action will tanks the markets and our 401k's and lead to more unemployment. Get government off the backs of business and if banks are that bad why is he taking thier campaign money. Stand for something and lead, but don't hose the little guy in the process. Obama had his chance to REALLY focus on the economy when Dems controlled the WH and all of Congress. He blew the opportunity to get his Affordable Healthcare Act into law. Big mistake. Now Obamacare will be repealed (good), and he will be a one termer (also good). When it took 3 yrs to come up with an idea about jobs, thats sad. And by the why he had 2 years controlling both house but decided to ram healthcare reform before jobs. Not looking to good for him. That probably means 75% give Republicans thumbs down on the economy, since they usually rate 10% or more below the President. Wow. 65% of people actually think the president controls the economy? This isn't North Korea, people. The disapproval percentage would have been higher but many of the people who should have been polled can't afford the phone to answer the poll questions. Obama should have been caring about jobs and the economy from day one, not making his mark on history. It's funny to note that there are people who give Obama thumbs up for handling of the unemployment situation. This president is worse than W who would do things whether right or not. This president just sits on his a...... while the nation is drowning. The only worry he has is about winning re-election. The irony is that there still are people who support him for doing nothing. He can come out with all the excuses in the world about republican opposition but those will always be excuses. He is the president and can take charge but he won't because he wants to get re-elected for another term. What a shame. Here's some questions for everyone that complains the president can't do anything: When the dems had the super majority why didn't they do anything then? If the president cant' do anything why did he make so many campaign promises? Also, if the president has no power to change the economy why is his speech so important then? I don't care who is in office. Things are a mess and there is nothing but talk and blame. What happened to the laser beam focus on job creation? You are all just making excuses for your golden boy who can do no wrong. While I do not fully support Pres. Obama on economic issues I have yet to see a viable, or even rational plan from either the GOP or the Tea Party. All the GOP\Tea Party crowd have done is complain, but present nothing that is even rational. What few "concepts" they have presented benefit few outside their wealthy benefactors. Trickle down economics, such as the GOP\Tea Party have advocated for 30 years, have not historically worked and do not work now. Many of the present economic issues can and do have their roots in the GWB administration and the GOP saying no to everything is not an answer.